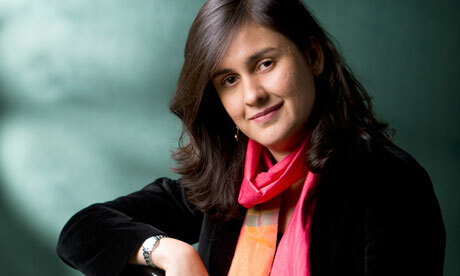 Novelist Kamila Shamsie has a knack for titles. She called her talk in Cleveland “Why Weep for Stones?” and built it into a riveting meditation on history, art, war and morals. Readers of her fiction – Shamsie won a 2010 Anisfield-Wolf prize for “Burnt Shadows” – will recognize the thematic confluence at once. Standing in the ornate neo-Gothic Harkness Chapel of Case Western Reserve University, Shamsie drew her listeners into thinking about the political destruction of art, such as the desecration and damage in Palmyra, Syria, amid a civil war that has claimed more than a quarter of a million lives. Recent reports indicate that some of Palmyra’s irreplaceable ruins have survived the fighting. Such pithiness made Shamsie a highlight of the Cleveland Humanities Festival, which spent the first ten days of April “Remembering War.” The novelist wrote her fifth of sixth novels, “Burnt Shadows,” out of the foreboding of nuclear war threatened between India and Pakistan. The book begins with the 1945 bombing of Nagasaki, and ends in 2002 in a U.S. prison cell, where a character awaits being sent to Guantanamo Bay. As the scope of “Burnt Shadows” indicates, Shamsie is deeply interested in history. She enlists it often in her writing, including frequent columns in the Guardian newspaper, to combat the amnesia that feeds toxic political impulses. Not so for ISIS, or, as Shamsie prefers, Daesh – a term this group has outlawed in the territories it controls. Daesh first desecrated the temple with public executions, then blew it up. Of course, some of this is propaganda. “After a point, the outside word stops being interested in the stories of human victims, but dynamite a 2,000 year old structure and you’re back in the headlines,” she said. In Pakistan a decade ago, Shamsie started meditating on “why weep for stones” when she visited Peshawar, near Afghanistan at the foot of the Khyber Pass. Within the city, Taliban influence has grown, and her own family in Karachi was nervous about her visit. She found it in the Peshawar Museum, where Shamsie entered “close to a state of rapture.” Nearby is a 2007 excavation trench revealing Peshawar as a continuously-inhabited city back to the 6th century B.C. Persians form the baseline. Then came Greeks, then Indo-Greeks, then Scytho-Parthians, then Kushans, then White Huns, then Mughals, then Sikhs and the British. Shamsie first arrived in the United States 25 years ago as a college exchange student. What she found as a Pakistani and Muslim, she said, was welcome. She called on her audience – embroiled in national political rhetoric of walls and banishment – to remember that version of American hospitality, and themselves. Tagged: 2010, Kamila Shamsie, winners.